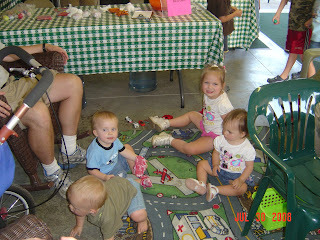 Here we take a break to eat and the kids enjoyed playing with some matchbox cars and stretching their legs. 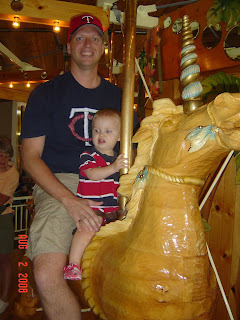 Mom and Dad also took us to Wabasha, MN where they have a neat toy store with a hand carved carousel in it. 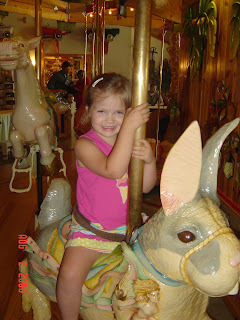 This is one of Hope's absolute favorite rides so she had a blast! 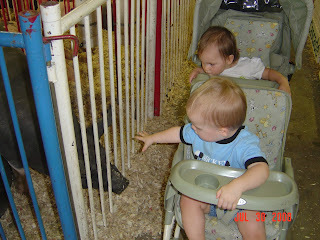 Grace and Nolan looked like they were not having a good time, but once we tried to take them off it was a different story! 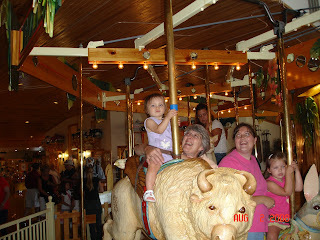 Grace had a death grip on the pole and was not going to be removed easily! We also enjoyed ice cream and looking at all the toys in the shop. 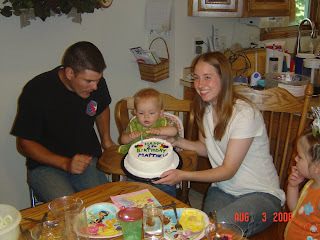 Another highlight was celebrating our nephew, Matthew's, first birthday and Hope's 4th birthday. We had a great family day together with both my siblings and their families. 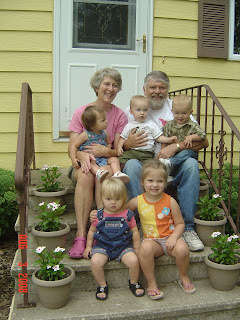 The house was very "busy", but the kids had a ball together and I think Grammy and Papa were having fun, too. By Christmas we will add 3 more little babies to the Peterson family: Jackie is due end of September, I am due early November and Coralie is due around Christmas! I will be sending out all of our trip pictures on Snapfish as well. Congratulations on your growing family! They are all so beautiful! What fun to keep up with you. 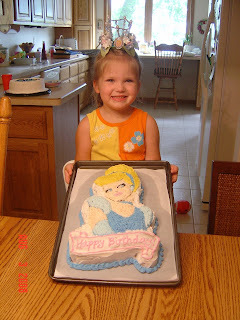 I just got your other pictures too. 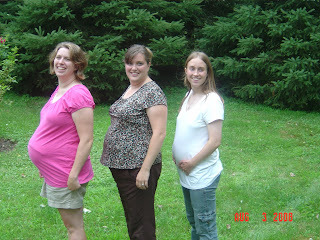 How cool that all of you are pregant together again! Keepin in touch! You guys all look so cute! Love the prego picture!! I am glad you had a great time! Love you! Hey, I love the photos and the stories. 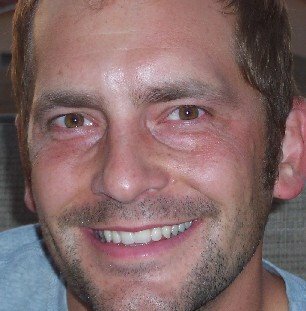 I loved the photos on snapfish too! 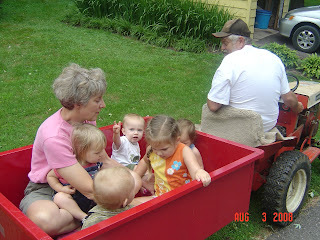 The photos of the grandkids with the grandparents are just precious, especially the tractor ride. 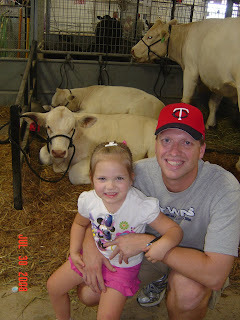 I was just thinking about how much fun your parents and all of the cousins are going to have with each other playing together on the farm as they get older. Your parents house is just going to be bustling with grandkids. It's so wonderful!